Scientists in Singapore have developed a skin patch that has the potential to help people to lose weight by causing white body fat to become brown body fat. If you didn’t know there were two types of body fat, don’t worry. Most people don’t. 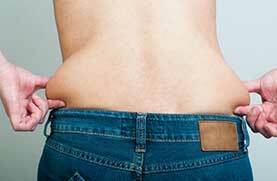 White fat is the type of fat that is formed when the body receives too many calories, and its presence around the belly area brings with it an increased risk of cardiovascular disease and cancer. Brown fat is a calorie burning fat, so it often called “good fat”, but the bad thing is most of use are not carrying much of it around. The idea of converting white fat to brown fat has fascinated scientists for a long time and tests conducted on laboratory mice suggest researchers at Nanyang Technological University may have finally made the dream a reality. They have achieved this by developing a special skin patch that contains hundreds of micro-needles that become embedded in the skin and penetrate the white fat tissue. As the micro-needles degrade they release drugs that cause the white fat to start turning brown. When the researchers tested the patch on mice that were being fed a high fat diet, they found it suppressed weight gain and reduced fat mass by more than 30%. Does this mean a new mini-needle slimming patch is likely to become available soon? Unfortunately not. The patches have never been tested on humans. The only thing that is certain is they appear to work for mice. News about new slimming patches always grabs a lot of attention because people like the idea of a weight loss product that can be applied to the skin and then left to get on with its work. It’s quick and easy and, in today’s increasingly hectic world, a no fuss option like that has a lot of appeal. However, it’s hard to understand why the researchers chose to use such an invasive type of patch technology. The idea of 100s of micro-needles degrading in their flesh could put a lot of people off and there does not appear to be a good reason to go this route. Slimming patches normally deliver their ingredients via a process called skin absorption. It’s the same process that nicotine replacement patches employ. Even the morphine patches doctors sometimes prescribe for extreme pain relief deliver the drug to the body via skin absorption and it’s a very effective way to do so. Skin absorption can be a particularly good delivery technique for weight loss formulas because the active ingredients are absorbed into the body over a prolonged period of time and can retain over 90% of their potency. It’s a different matter entirely with diet pills. When pills are swallowed the active ingredients are subjected to harsh digestive enzymes that can rob them off their power and two or more doses are required every day. The fact that slimming patches are becoming so popular is probably only partly due to how efficient and effective they are, people are also attracted to them because they are so easy to use. There’s no need to time their use to within so many minutes of a meal or take them at certain time, slimming patches are “plug and play” weight loss supplement. All you have to do is apply them to a clean area of skin and you are good to go. They are also a perfect choice for anyone who finds it difficult to swallow pills. The main reason the scientists Nanyang Technological University decided to develop their multi-needle patch was because they needed a better delivery system. Previous studies, involving a thyroid hormone (T3 triiodothyronine) and a Beta-3 adrenergic receptor agonist had shown it was possible to get white fat to turn brown, but potentially serious side effects were possible when they were consumed in pill form. Patch technology made it possible to get good results using lower doses and there were no side effects. Multi-needle patch technology is unlikely to be more efficient than skin delivery patches, though, and will almost certainly prove to be more expensive. The researchers estimate the cost of producing a single patch would be $2.60. Patches that utilize skin absorption can be produced much cheaper that this and the elevated costs involved with producing a patch full of needles are bound to be passed on to the consumer. 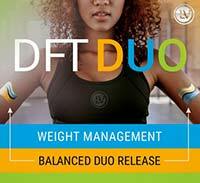 DFT Duo is a diet patch that is part of a range of health and wellness products marketed under the Thrive brand name. Thrive products are produced by a multi-level marketing (MLM) company called Le-Vel. MLM is not dissimilar to pyramid selling, and businesses that operate such a system are often more focused on the business opportunity than the product so, not surprisingly, some MLM products are not all that good. However, in order to be fair to Le-Vel, we must point out the company website puts an unusual amount of focus on the products. The information provided is rather hyped up, and somewhat lacking in facts, but the Thrive business opportunity appears to be secondary to the products and that’s unusual with MLM. We don’t want to become overly focused on the MLM side of things but, for those readers who are not familiar with this kind of marketing, MLM products are usually only available via people who have signed up and become a distributor. This allows them to earn a commission on the sales they make, but that’s only half the story, If they recruit other distributors they can also earn a commission on the sales their recruits make as well, along with smaller commissions for the sales made by the rest of their downnline. It all sounds very good in theory, but there are a lot of flaws to the concept and the chances of even making a living wage are slim to say the least. How is Thrive DFT Duo Different From Other Diet Patches? Apart from the way it’s sold, the big difference between Thrive DFT Duo and other diet patches is it comes in two parts. One half is affixed to left hand side of the body and the other is attached to the right. If this has its advantages they are not explained, potential customers are only told it will cause the “fusion footprint” to become larger. How Are the Patches Used? Customers are told to apply the patches to either side of the body. The suggested areas are the inner arms, biceps, shoulders, and upper buttock area. The patches are left in place for 24-hours and the application point should be rotated each day. Thrive Premium Lifestyle Capsules: A capsule that provides vitamins minerals and other nutrients that are intended to rectify nutritional imbalances and boost mental and physical function. There are two versions. One for women and another for men. Thrive Premium Lifestyle Mix: A shake mix that provides a further dose of nutrients that are intended to improve the health and help you become the “premium you”. Although customers are urged to use the three products together for eight weeks, as part of the “Thrive experience”, the patches appear to be intended to be the main weight loss provider. 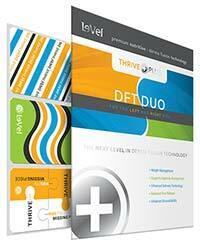 What are the Ingredients Used in Thrive DFT Duo? Are the Ingredients Good Enough to Work? Some of the ingredients are very good, but there is no way of knowing if enough of each one is included and they are mixed with ingredients that have less to offer and may dilute their abilities. White willow bark is a good example. If you need a natural painkiller it could be for you. If you want to lose weight it is unlikely to help. We don’t see anything that will offer much in the way of appetite management, but some evidence suggests aloe vera may lower blood sugar levels. Chlorogenic acid can also help with this, but it is more commonly associated with thermogenic fat burning. Yes, we found lots of feedback and most of it was excellent, but it would have been more credible if it hadn’t been left by product distributors. Are There Any Side Effects to Thrive DFT Duo ? Where Can I Buy Thrive DFT Duo? Thrive products are only available from the Le-Vel website, but you cannot buy them unless you have been referred by a distributor. How Much Do the Patches Cost? The price of the patches is only available to Thrive customers who have been referred by a distributor. Customers who return unopened products (at their own expense) within 30 days of ordering them can claim a 90% refund. 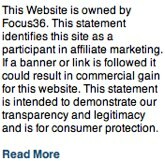 If the product has been partially used they will only be eligible for a 50% refund. Is Thrive DFT Duo Worth the Money? It’s hard to say if the product is worth the money because its price is kept under wraps and there is no proof that it works. It contains some good ingredients, but it may not contain enough and there is a lack of unbiased product reviews. If it is not too expensive, and helps people to lose weight, it may be worth the money. If it doesn’t work, or people have to stop using it because of side effects, the lack of full money back guarantee means money will have been wasted. There are a lot of unknowns with this product, so potential users will need to think long and hard before committing to buy.